Exhibition celebrating 2000 years from Augustus death. “Keys To Rome” is a unique international exhibition, that, for the first time ever the 23rd of September, will be organized in parallel in four incredible locations: Rome, in the wonderful setting of the Imperial Fora Museum; Alexandria, in the amazing rooms of the Bibliotheca Alexandrina; Amsterdam, in the recently renovated Allard Pierson Museum; and Sarajevo, in the newly restored City Hall. “Keys To Rome” is organized by the largest European network of excellence on Virtual Museums, V-MUST, coordinated by the Italian National Council of Researches. In the Great Hall of the Imperial Fora Museum, a map of the city will give the visitor the feeling of “walking” within the city of Rome of two thousand years ago. The Forum of Augustus, the Mausoleum, the Ara Pacis and all the other monuments, will “emerge” from the map and tell their own story. 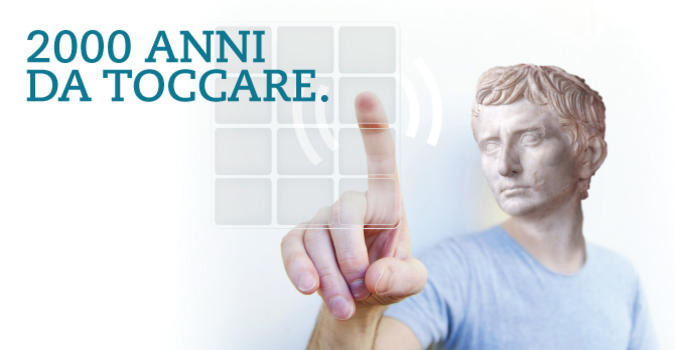 Two busts of the great characters of the Roman Republic, will come to life and talk about the strategies and the historical events that have led to the rise of Augustus. Finally, video panels will illustrate the news on the latest scientific excavations, witnessing the ongoing research and the presence on the territory of archaeologists of the Superintendency of the City of Rome.